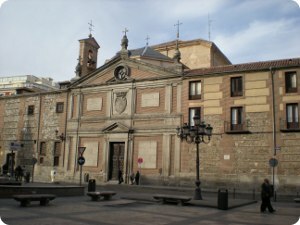 The Monastery of Barefoot Royals (Monasterio de las Descalzas Reales in Spanish) is a franciscan convent, also known as Monasterio de Nuestra Señora la Consolación. It occupies the old palace where they resided Carlos I and Isabel of Portugal, where he was born in 1535, his daughter Juana. And it were founded as a convent in 1557 by Juana. The convent boasts an impressive collection of art and relics. Amongst its attractions are an array of marble sculptures, and works by Tiziano, Sánchez Coello and Luini. Other important collections are the tapestries woven in Brussels (were based on drawings by Rubens), and representing the Apotheosis of the Eucharist. The convent still houses a number of Franciscan nuns, living in an enclosed order as solitaries and devoting their lives to prayer, contemplation. The cloister is well known as the site of processions during Holy Week, especially on Good Friday, where the event is accompanied by music from the era when the convent was founded. The Monastery is the first of Central Madrid's royal monasteries (the other is the Monasterio de la Encarnación). As at the Monasterio de la Encarnación, visits to the Monasterio de las Descalzas Reales are by guided tours in Spanish only. Tuesday to Saturday: 10:00 to 14:00 and 16:00 to 18:30. Sundays and holidays: 10:00 to 15:00. * Lines 5 and 2 - Ópera station. * Lines 5 and 3 - Callao station.